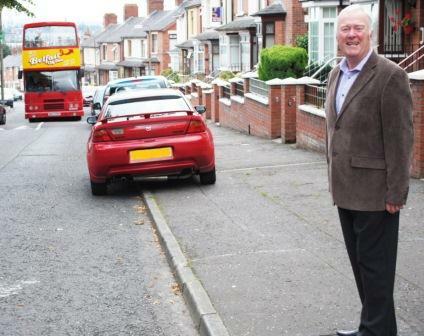 A special tour bus wound its way along the Falls Road on Saturday, August 4th 2012, to launch the new Belfast Celtic Trail. Families of former players as well as Celtic fans traced the steps of the club across its west Belfast heartland, as part of Feile an Phobail, the largest community festival in Ireland. Beginning at the former site of the Centre Half Bar on the Falls Road, owned by Mickey Hamill, the trail marks 15 points of interest which includes former pitches, players homes and businesses and the graves of key figures in the club’s history. 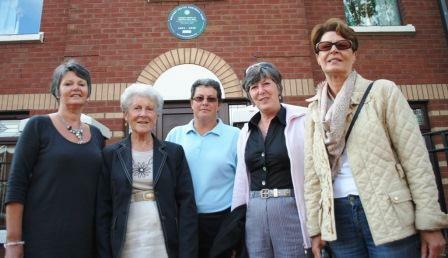 And to cap off the day, the Belfast Celtic Museum was re-opened at the Park Centre, the site of the club’s home, Celtic Park. Members of the Hamill and McAlinden family at the site of Belfast Celtic star Mickey Hamill’s Centre Half bar, which once sat on the corner of Falls Road and Panton Street. A very special tour guide was provided, as the ghost of Celtic legend Charles Patrick Tully was raised in the form of local actor Gerard Jordan, who played the role in the Return to Paradise play at the Lyric Theatre. 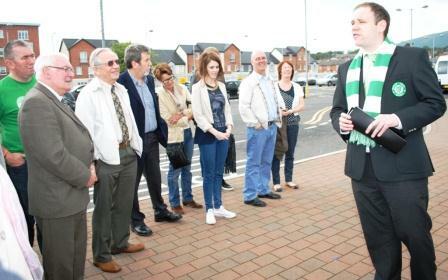 Padraig Coyle, Chair of the Belfast Celtic Society, was enthused by the turn-out. 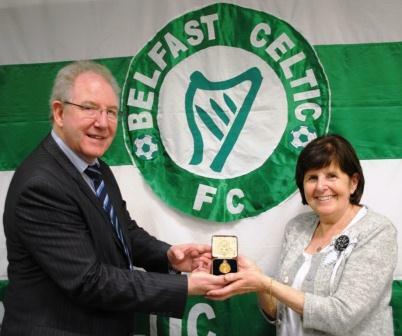 “Belfast Celtic was an important part of the fabric of the west Belfast community for 50 years and it remains so today, six decades since the team last kicked a ball." “I want to thank the Irish Football Association for helping fund the Trail, under the European Peace III Measures and we were honoured to have IFA President Jim Shaw on the bus to enjoy the show. It was so humbling to be in the company of the families of Celtic legends like Mickey Hamill, Jimmy McAlinden, Paddy Bonnar, Tommy Breen and Kevin McAlinden." Frank Hennessey (left), the final Secretary of Belfast Celtic, joins Jim Shaw, President of the Irish Football Association and Padraig Coyle, Chairman of the Belfast Celtic Society, prepare to mount the special tour bus to sample the new Belfast Celtic Trail. that he collected while at Portsmouth. “This Trail keeps the old club literally on the map and adds a new, major presence on the already very well established west Belfast tourist trail. Our Society has recently taken possession of a large amount of documentation regarding the club and we have published player lists on our website to help those researching family ties with Belfast Celtic. Some of the documentation has been made available in our new ‘Boardroom’ display at the museum. The Museum will now be open at least once each week, on alternate Thursdays and Saturdays. Copies of the Belfast Celtic Trail brochure will be made available through local tourist outlets and on the website. More pictures of the days events follow this article. 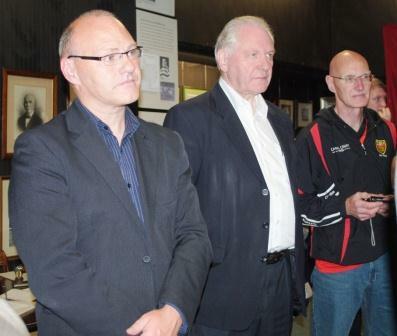 the exhibits at the Belfast Celtic Museum in the Park Centre. 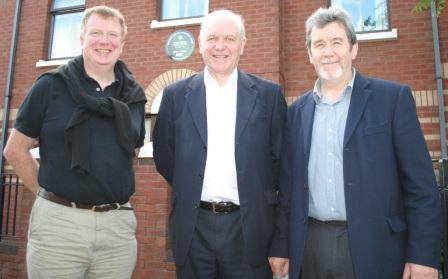 Local actor Gerard Jordan (right), who took on the persona of Belfast Celtic legend Charlie Tully for a day, closes the Belfast Celtic Trail at the Park Centre, the site of the club’s former home, Celtic Park.